One thing we occasionally like to do in this space, especially during the late summer dog days when nothing else is happening, is leaf through the pages of the NHL record book. While many of you who read these posts are hockey diehards with decades of fandom under your belts, I realize that others may be slightly newer to the sport. 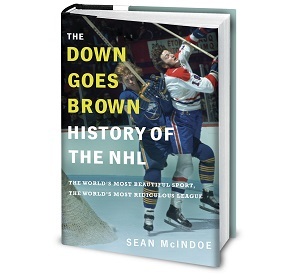 So every now and then, it can be fun to take an educational and nuanced look back through NHL history. And so, in that spirit, today we’re debuting a feature called Holy Crap, the 1980s Were Freaking Insane. Because, good lord, that entire decade was incredibly offensive. Not surprisingly, most of the major scoring records were established during the ’80s, many of which are unlikely to ever even come close to being matched. Even casual fans probably know some of them by heart, like Wayne Gretzky’s 92 goals in 1981-82 and 215 points in 1985-86, or Mike Bossy’s nine consecutive 50-plus-goal seasons to start his career. But it wasn’t just the household names who racked up obscene numbers during the decade. Just about everyone, from Hall of Famers to guys you barely remember, was putting up ridiculous numbers. That’s what made the ’80s so much fun. And it’s why it’s worth taking an occasional look back at some of the madness that went on. Nilsson played just eight full NHL seasons with no major awards, and depending on how old you are or how well you remember the 1980s, there’s a good chance he’s the most productive player you’ve never heard of. After two years in the WHA, Nilsson made his NHL debut with the Flames at the beginning of the 1979-80 season. He was traded to the North Stars in 1985, and split two more seasons between Minnesota and Edmonton before heading back home to Europe. Except for a six-game comeback attempt with the Oilers in 1995, his NHL career was essentially over by 1987. He played in only two All-Star games, the last in 1981, and was never really considered one of the league’s top players. In fact, he may be best remembered as the Oiler who got hacked by Ron Hextall in the 1987 final. He also struggled to stay healthy in his later years, only hitting the 70-game mark once after 1983. That last bit was good news for opposing goaltenders, because whenever Nilsson did play, he racked up points at a rate that was almost unmatched in league history. That’s not an exaggeration — Nilsson’s career point-per-game average ranks him ninth on the all-time list. Here’s a look at a few of the guys who are trailing him. They’re pretty good. Part of that’s due to Nilsson’s elite (if underappreciated) skill level; he was nicknamed the Magic Man and was considered the true inventor of the breakaway move we now know as the Forsberg. But it’s also a factor of him playing in the madness of the 1980s. Of the top 25 players on the point-per-game list, 15 played a big chunk of their careers during the decade.